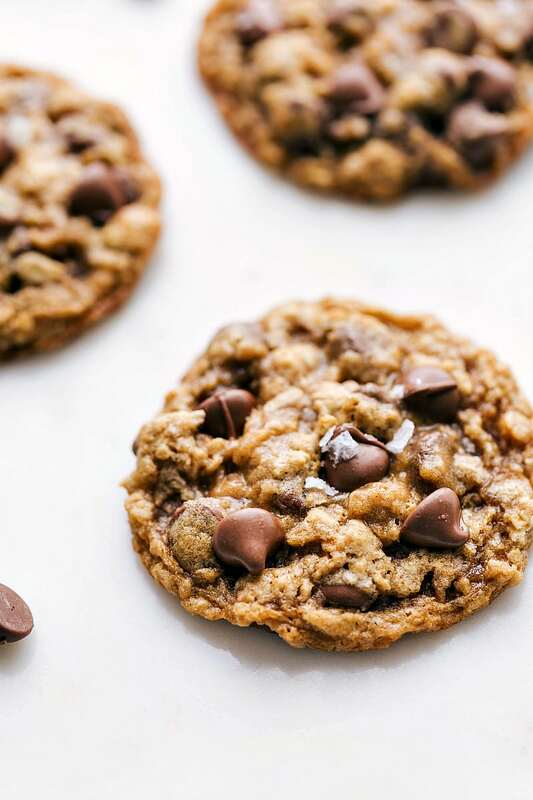 Delicious and flavorful oatmeal chocolate chip cookies — crisp on the edges and a soft, chewy center with plenty of chocolate. 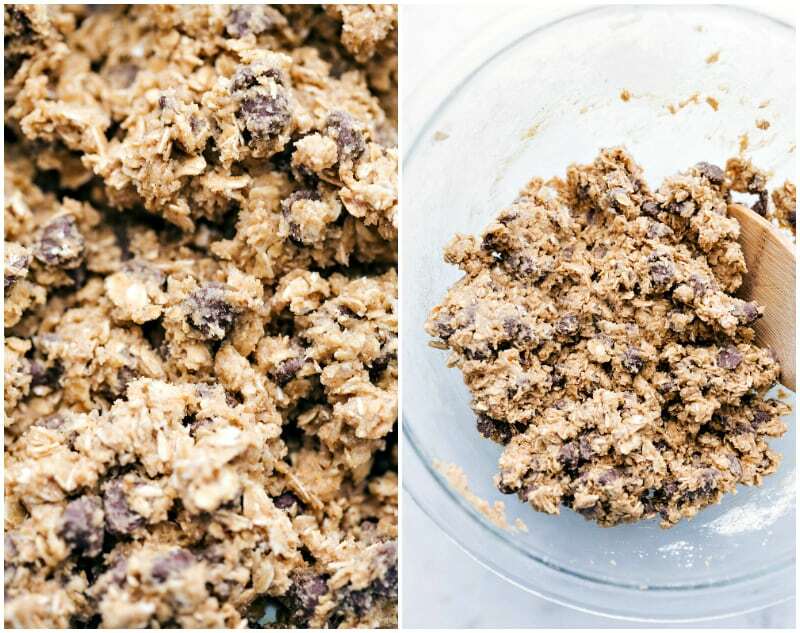 If you like oatmeal raisin cookies, this recipe works great (just swap chips for raisins). Or try these old fashioned oatmeal cookies to skip out on chocolate/raisins completely! And after you’ve gotten your oatmeal fix, you’ve got to try these famous snickerdoodles or soft and chewy peanut butter cookies! 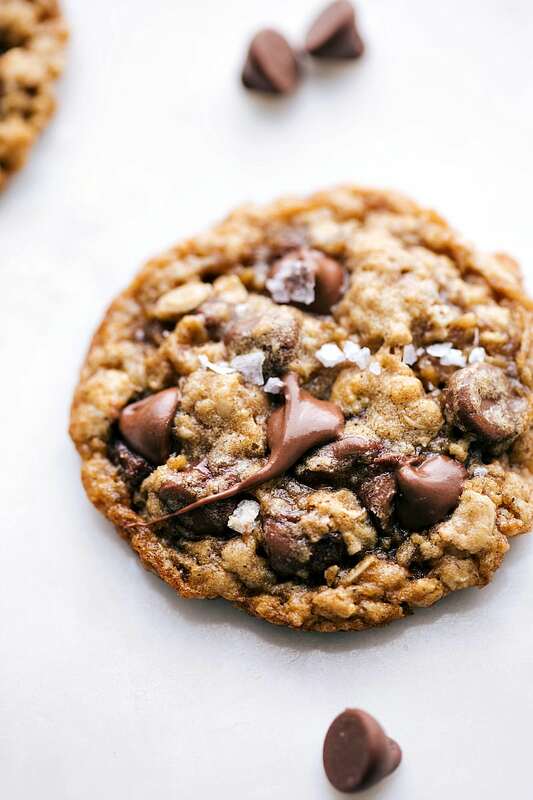 Soft, chewy, buttery, and best of all CHOCOLATEY: these oatmeal chocolate chip cookies are the absolute best! 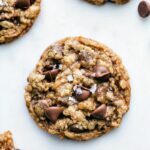 I don’t know if it makes me boring, but oatmeal chocolate chip cookies are hands down my favorite cookie and this recipe is the BEST. Plus these cookies are very easy to make. Read on about how to make them and a few quick tips for making these cookies absolutely perfect. 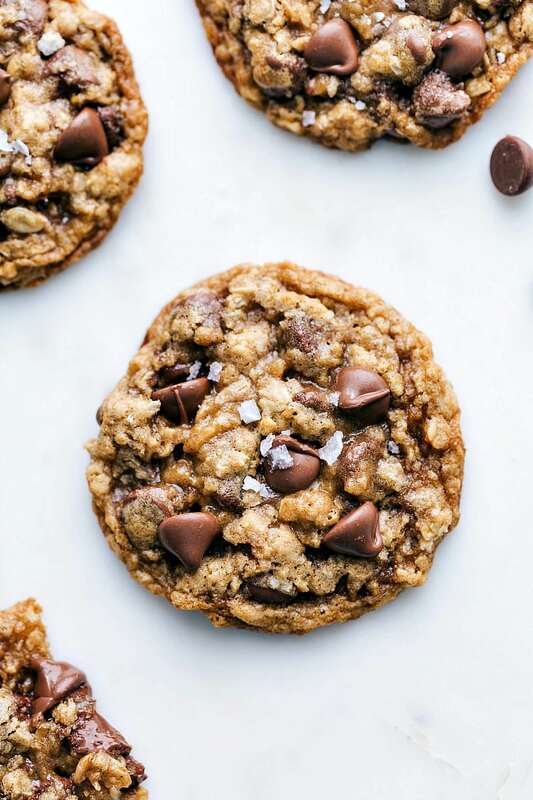 The process for making these oatmeal chocolate chip cookies isn’t too different from your standard cookie recipe — beat together wet ingredients, add dry ingredients, mix, and then chill the dough. Chilling the dough makes a huge difference in both the flavor and the texture of the cookies. Without chilling the dough, your cookies will spread and you’ll miss out on the soft chewy texture. 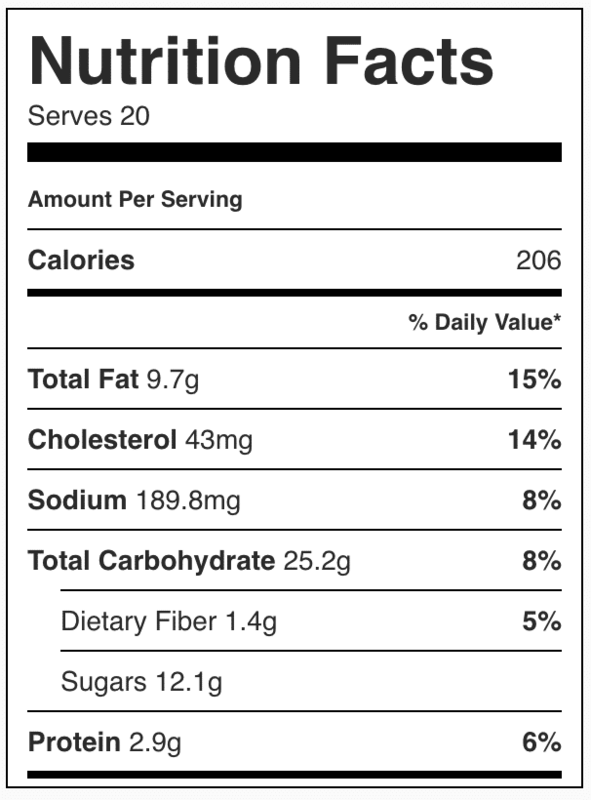 Precise measuring – if you use too much flour, you’ll end up with dense, overly puffy cookies. Spoon your flour into the measuring cup (if you scoop it into a measuring cup, it usually gets packed in too tightly) and level it off with the flat edge of a butter knife. Slightly under bake for the delicious super soft and chewy texture we all love! Over-baked oatmeal cookies lose their chewy texture and a lot of flavor. Measure dough balls: For completely even baking from cookie to cookie I LOVE and recommend using a food scale. Add additional chocolate chips on top: completely optional, but not only does it make your cookies beautiful, it also ensures you’re getting chocolate in every single bite! Right after the cookies come out of the oven, you can press a few chips into the top of them. Are oatmeal cookies healthier than chocolate chip? Yes! Old fashioned oats are recommended for these chocolate chip oatmeal cookies. 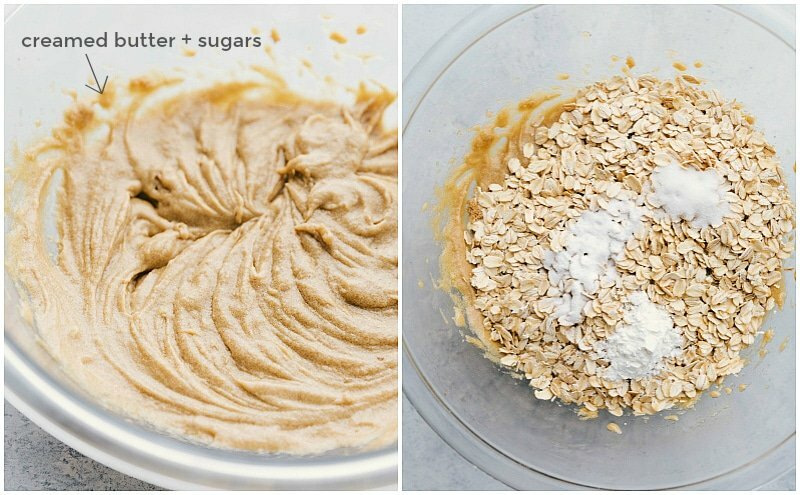 Because quick oats are so small they basically act like a flour and will make the oatmeal cookies have a completely different texture. That’s not a bad thing, but the rest of the recipe needs to adjust for the different oats. If you only have quick oats, this oatmeal creme pie recipe uses them! These chocolate chip oatmeal cookies are soft and chewy! My number one tip for keeping them that way: do not over bake. Over-baked cookies lose their texture, chewiness, and a lot of flavor. Can I freeze chocolate chip oatmeal cookies? Yes! To freeze baked cookies: place completely cooled cookies on a baking sheet and freeze until solid. Next, place the cookies in freezer bags or plastic tupperware container layering parchment paper in between each row of cookie. Freeze for up to 3 months! To freeze unbaked cookies: place shaped cookie dough balls on a baking sheet and freeze until solid. Place frozen cookie dough balls in a freezer bag or plastic tupperware container. When ready to bake, you do not have to thaw the cookie dough. Simply place the frozen, dough onto a baking sheet and bake for 2-3 minutes longer than the recipe indicates. Delicious and flavorful oatmeal chocolate chip cookies -- crisp on the edges and a soft, chewy center with plenty of chocolate. In a large bowl, add the ROOM TEMPERATURE (don't melt or soften) butter, brown sugar, and white sugar. Beat until smooth and creamy, about 2-3 minutes. Add the eggs and vanilla extract and beat until combined, scraping the sides as needed. On top of the wet ingredients, add the cornstarch, baking soda, salt, and old fashioned oats. Beat to combine. 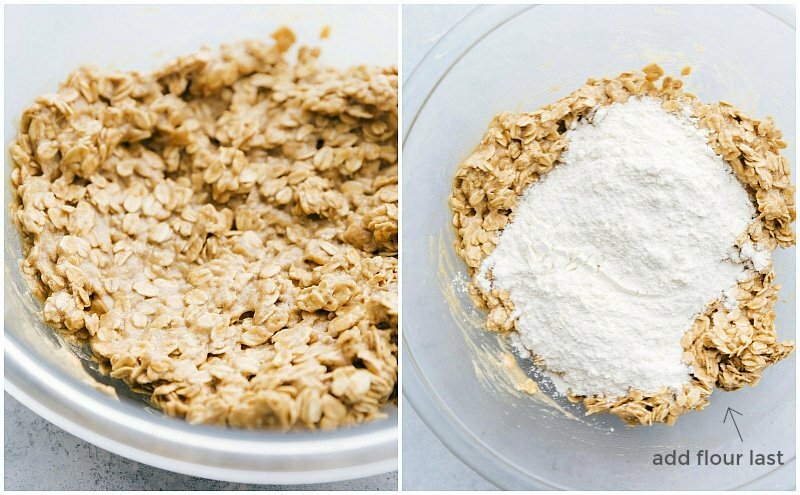 Once ingredients are combined, add in the flour (make sure to spoon and level this measurement!) Mix until JUST combined being careful to not over beat the mixture. Using a spatula, fold in 1 cup of the chocolate chips. Preheat the oven to 350 degrees F. Line your sheet pans with a silpat liner or parchment paper. 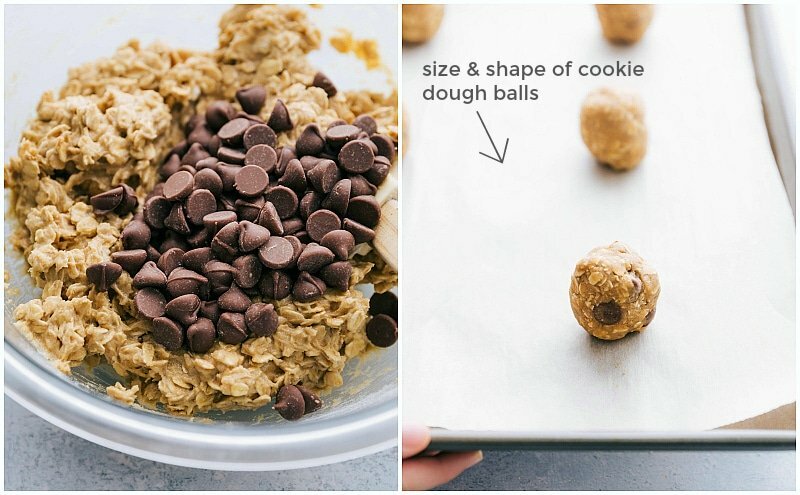 Roll cookie dough balls (if you have a food scale -- 1.7 ounces). Roll the balls higher rather than wider (see photos) and place on the prepared sheet pan. Bake 8-11 minutes watching the cookies carefully near the end of baking. Err for slightly under baking to keep these cookies soft and chewy! They might look a tiny wet in the center, but will harden as they cool! *We LOVE Ghirardelli or Guittard milk chocolate chips in these cookies, but use your favorite type of chocolate chip (semi-sweet or dark). To use raisins, soak the raisins in hot water for 10 minutes, drain and thoroughly dry, and then add to these cookies in place of the chips. Oatmeal Chocolate Chip Cookie Recipe highly adapted from AllRecipes. I am not sure what happened but the cookies ended up like little balls. They never spread out at all. And I am wondering what the purpose of the cornstarch is? No other recipes have that in them. It is a thickening agent and they are already pretty thick. How did you measure your flour? If you scoop it into a bag it is going to pack in way more flour than spooning and leveling the measurement. And did you chill for longer than an hour? These were amazing! Thank you for the recipe!!!! So happy to hear it; you’re welcome! 🙂 Thanks for the comment and review Sara! Made these with whole wheat flour. My cookie curse may be over as these are the first cookies I have made,besides sugar cookies, that have turned out. Yay!! So happy to hear that! Thanks for the comment Fiona! I skipped the cornstarch but did everything else the same and they still turned out great! I pressed roasted unsalted almond slivers into them when they came out of the oven and the almond flavor added umami. Delicious! Thanks for the new recipe, Chelsea! French relay marathon runners and they turned out even better this time!